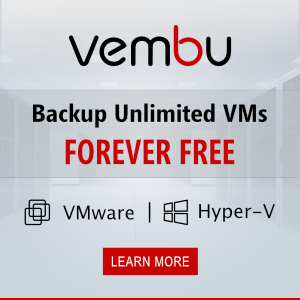 Let’s consider the peculiarities of granting remote access permission to enumerate the list of services running on a remote server to domain users without rights of local administrators. In fact, the task comes down to providing remote connection to the Service Control Manager (SCManager). Here is what the problem looks like. Suppose, we want a remote user or monitoring system can query the status of services on some server. On obvious reasons, this remote user doesn’t have any administrative rights and a privilege to access the server locally. The access to the list of services is controlled by the security descriptor of Service Control Manager database, for which the remote access of the users from the “Authenticated Users” was restricted in Windows 2003 SP1 already (that is quite logical). Only members of the Local Administrators group have the right to access this service remotely. 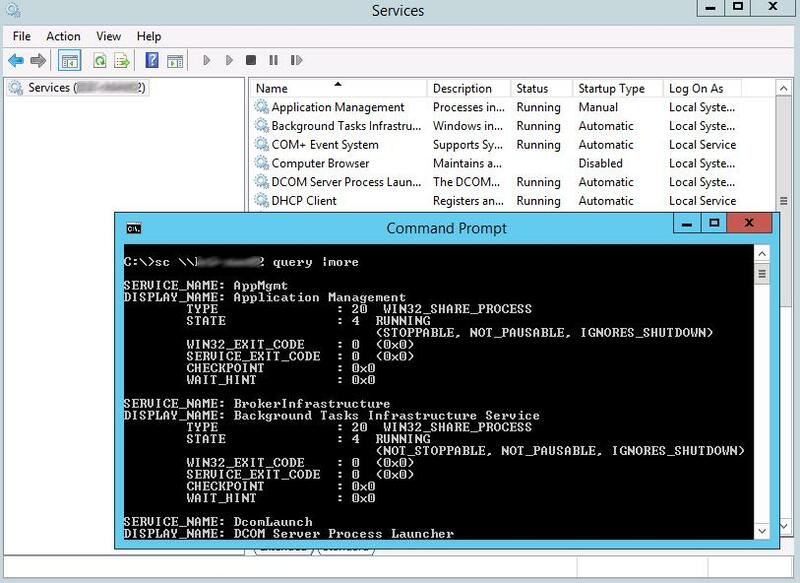 Let’s consider how to grant the remote access to Service Control Manager to get the list of services on a server and how common users (without administrative rights) can get statuses of these services in Windows Server 2012 R2. In this case you can see that by default the Authenticated Users (AU) group is allowed only to connect using SCM, but not to poll (LC) the services. Copy this string to any text editor. The string [SC] SetServiceObjectSecurity SUCCESS tells that the new security parameters have been successfully applied, and the user has got the privileges similar to those of locally authenticated users: SC_MANAGER_CONNECT, SC_MANAGER_ENUMERATE_SERVICE, SC_MANAGER_QUERY_LOCK_STATUS and STANDARD_RIGHTS_READ. Naturally, you don’t have any privileges to manage the services, since the access to each service is controlled by an individual ACL. 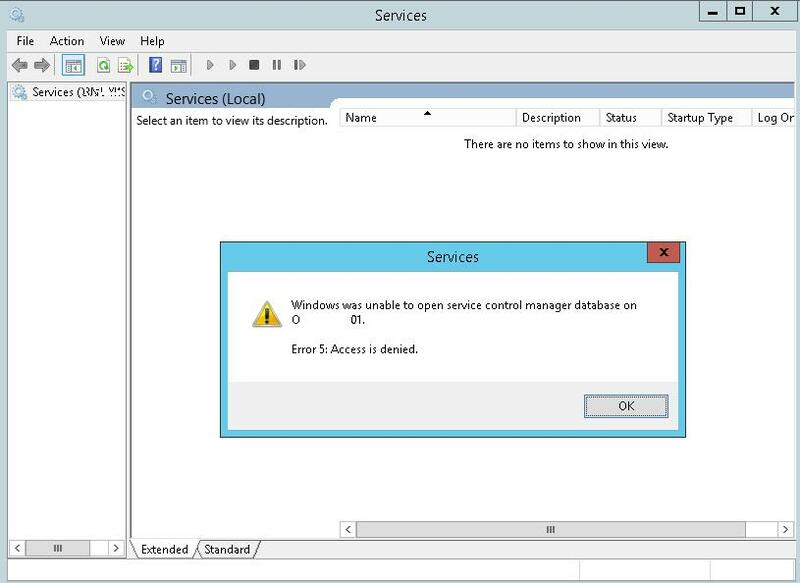 To grant the privileges to start/stop server services to a user, follow the instructions in the article How to Grant Permissions to Manage (Start, Stop or Restart) Windows Services to a User. Tip. If you assign any SCManager rights different from typical ones, they are saved in HKLM\SYSTEM\CurrentControlSet\Control\ServiceGroupOrder\Security branch of the registry. Anf if you have made a mistake when preparing an SDDL string, you can delete this branch and restart your computer to reset the current permissions to the default ones. If you’d like to grant permissions to manage services without dealing with SDDL strings or changing the registry on every machine, take a look at System Frontier. You can centrally delegate rights through a web interface and even use wildcards to give access to specific services by name. It’s a paid product, but still free up to 5 nodes.